Gandhak Rasayan (also spelled as Gandhaka Rasayana) is an ayurvedic mineral-based medicine, which contains detoxified Sulfur processed with herbal juice as a main ingredient. 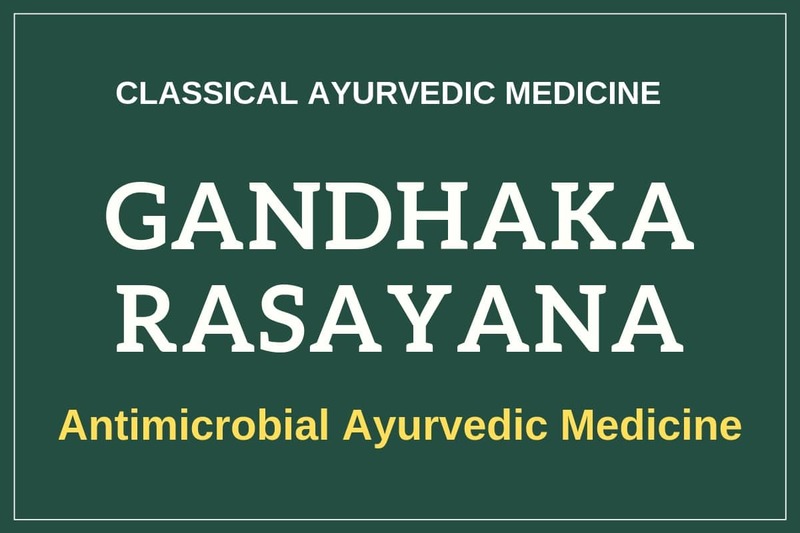 Gandhak Rasayan is a great antibacterial, antiviral and antimicrobial ayurvedic medicine. It is beneficial in almost all types of infections due to its broad-spectrum antibiotic activity. Shuddha Gandhak or purified/detoxified Sulfur is a main ingredient used in preparation of Gandhak Rasayan. Gandhak is detoxified using clarified butter (Ghee) before using it in preparation of Gandhak Rasayan. Then it is processed with Cow’s Milk. After that, it is again processed with following herbal decoctions and juices separately. Chaturjat contains cinnamon (Cinnamomum zeylanicum), Cardamom (Elettaria cardamomum), tejpat (Malabar leaf or Cinnamomum tamala) and Nagakesara (Mesua ferrea). Some companies also add sugar after processing with above herbal decoctions and juices. Gandhak Rasayan has following healing properties. Gandhak Rasayan is helpful in following health conditions. Gandhak Rasayan works well in all health conditions with a common symptom of burning sensation. It is beneficial in diseases such as urinary tract infections, burning sensation in hands and feet, burning sensation in skin, itching, burning sensation of tongue etc. The main medicinal uses and benefits of Gandhak Rasayan are discussed as follows. Small red spot occurs on the skin due to allergic reaction to allergens. It causes itching and sometimes burning sensation on the skin. Gandhak Rasayan is a drug of choice in ayurveda for this condition. However, sometimes, it may not work alone, so your doctor may also suggest other remedies including Jasad bhasma and Haridra Khand. If burning becomes worse, then Giloy Satva, Praval Pishti, Moti Pishti and Mukta Sukti Pishi Should be added. Internally, Gandhak Rasayan helps eliminating itching and scabies rashes. However, you also require local application of neem oil or neem leaves and turmeric (Curcuma Longa) paste to get rid of this infection. Gandhak Rasayan reduces acne and pimples. It helps by purifying blood, eliminating blockage, stopping secondary infections. Generally, it is used along with Shankh bhasma and Mukta Sukti Bhasma or Pishti. The dosage of Gandhak Rasayan can vary according to age, health condition and several other factors. The safest dosage of Gandhak Rasayan is around 250 mg to 500 mg twice or thrice a day. Gandhak Rasayan is POSSIBLY SAFE if prepared strictly according to ayurvedic principles. Changes in preparation methods or eating raw sulfur can lead a variety of adverse effects. The excess dosage (more than 2 grams a day) of Gandhak Rasayan can cause following side effects. No information is available about the safety and efficacy of Gandhak Rasayan in pregnancy and breastfeeding. Therefore, stay on safer side and avoid using Gandhak Rasayan in pregnancy and breastfeeding or consult your family physician or ayurvedic doctor before use. Hello sir, I’m 36 years for 6 months I got so many folding on my face especially on my cheeks. Can use gandhak rasayan Please respond. Are you talking about wrinkles? I have colitis diagnose by homeopathy doctor. Stool test report shows Escharchia Coli bacteria cysts found. Stool culture shows no growth. Is gandhak rasayan can kill e Coli bacteria in gut. You wrote that gandhak rasayan cure urinary track infection. Which is also cause by e Coli most of the time. Ativisha, Chirayata, Giloy are the most effective herbs for E. Pylori infection. In addition, Leela Vilas Ras is also an effective ayurvedic medicine for this. Leela Vilas Ras contains Gandhak as an important ingredient. However, patient may also require other medicines for supportive purposes.